Take a look at our video explaining how to add a question to your existing template. If you want to a more detailed description, then take a further look below and read our step-by-step guide! When you've given the template a name, it's time to add sections with questions in them. A section is like a chapter; most of the time it's covers a subject within a form (e.g. electricity or first aid). 3. Give in the question you want to ask in the 'name field'. In this example I want to ask what location is being inspected. 4. Then select one of the eight answer types. 5. If you've selected single or multiple select, start adding the answer options. 6. Switch tabs to add a placeholder or a help text/image. 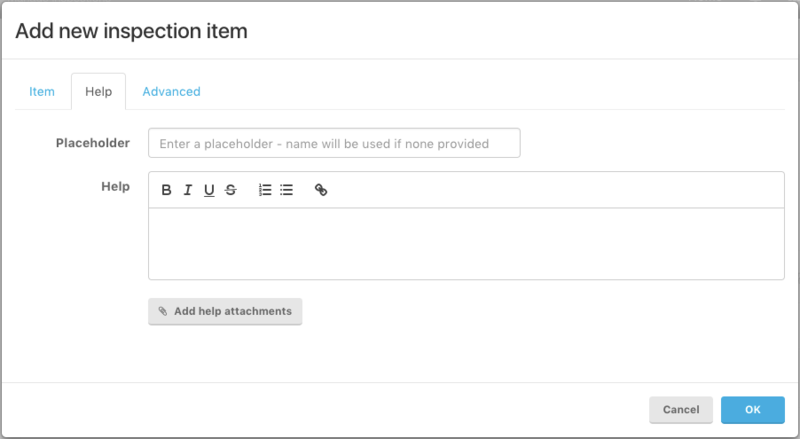 A placeholder means an example text in an open text field. A help text can be anything to assist the inspector. You can also add help images to clarify your question. Pattern: validate an answer, e.g. check whether an email address has an @ and a country code. Repeat this until you've added all questions for this template!